Every nature lover will enjoy seeing our Explorer garden gnome our in their backyard, gently holding a sweet bluebird. His friendly expression, long white beard, blue top and bright red hat will bring warmth and joy to any garden space. 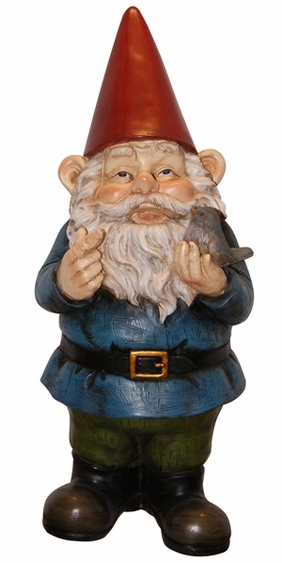 If you're looking for fun garden gnomes, our large selection of gnome figurines are made from tough and durable weather-resistant cast resin. These 12-inch high statues are made to last a long time.